PR Newswire, [San Francisco, CA] [July 29, 2016] — The following is being released by Volkswagen Group of America and the Plaintiffs’ Steering Committee in relation to the multi-district litigation: In Re: Volkswagen “Clean Diesel,” No. 3:15-md-2672. The U.S. Federal Trade Commission. In addition, Volkswagen has reached settlements with certain states and other U.S. jurisdictions. 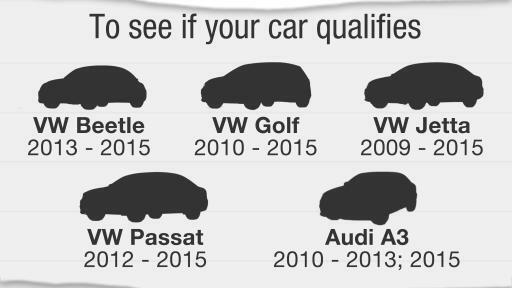 The goal of the Settlements is to compensate customers who owned or leased a Volkswagen or Audi 2.0-liter TDI vehicle (“Eligible Vehicle”) as of September 18, 2015 (the date the emissions allegations became public) or who now owns or leases an Eligible Vehicle. Potential claimants should now visit the Settlements’ website at www.VWCourtSettlement.com for information about their rights and options under the Settlements (including the option to “opt out” of the Class) and details about payments they may be eligible to receive. A vehicle buyback option: Eligible Owners may choose to return their vehicles for payment. The total offer compensates Eligible Owners for their vehicle and the cost of purchasing another vehicle, and it includes two components: 1) a vehicle return amount derived from the September 2015 NADA Used Car Guide Clean Trade, including manufacturer-installed options; plus 2) additional restitution, which is the sum of a set percentage of the vehicle return amount and a flat dollar amount. A lease termination option: Eligible Lessees may choose to terminate their lease and return their vehicles for payment. These Eligible Lessees will not be charged an early lease termination fee, and the total offer includes two components: 1) a vehicle return amount derived from the September 2015 NADA Used Car Guide Clean Trade, including manufacturer-installed options; plus 2) additional restitution, which is a fixed dollar amount. An approved emissions modification option: Eligible Owners and Lessees may choose to keep their vehicles and receive an Approved Emissions Modification and an extended emissions warranty free of charge. This option will only be available if the emissions modification is approved by the EPA and CARB. Payments are also available to certain former owners who choose to participate in the Settlements and register by September 16, 2016. If these eligible sellers do not register to claim benefits under the Settlements by September 16, 2016, they will lose their benefits. Payments are also available to certain former lessees who leased an Eligible Vehicle through Volkswagen Credit, Inc. or Audi Financial Services and had an active lease on September 18, 2015, but returned their vehicle at the end of their lease term. Volkswagen will establish a sole funding pool for the Settlements of a maximum $10.033 billion. The funding pool is based on an assumed 100% consumer participation rate, 100% Buyback of all purchased Eligible Vehicles, and 100% Lease Termination of all leased Eligible Vehicles. In addition, Volkswagen will pay $2.7 billion into a Trust to support environmental programs that will reduce nitrogen oxides (NOx) in the atmosphere by an amount intended to fully mitigate the past and future excess emissions from the 2.0-liter TDI vehicles. Volkswagen also will invest $2 billion to promote zero emissions vehicle (ZEV) infrastructure, over and above any amount Volkswagen previously planned to spend on such technology. 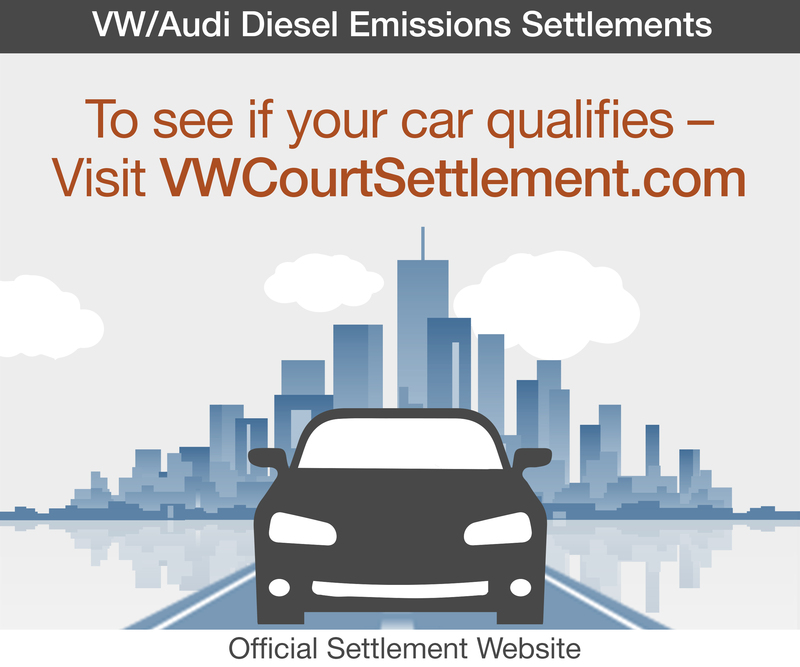 Volkswagen has agreed to begin the 2.0-liter TDI settlement program immediately after the Court grants final approval of the Settlements. 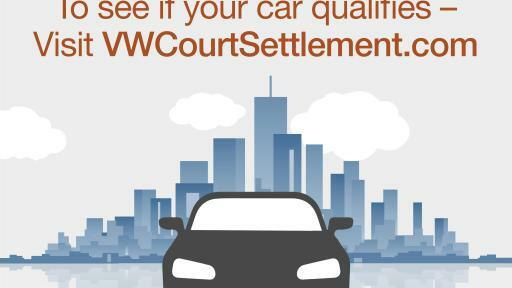 Customers can now visit the Settlements website, www.VWCourtSettlement.com, and determine if they may be eligible; if so, they will be directed to the Online Claims Portal where they can enter their Vehicle Identification Number (VIN) and mileage, and see their options under the Settlements. Consumers will be able to submit any required documentation later in the process. 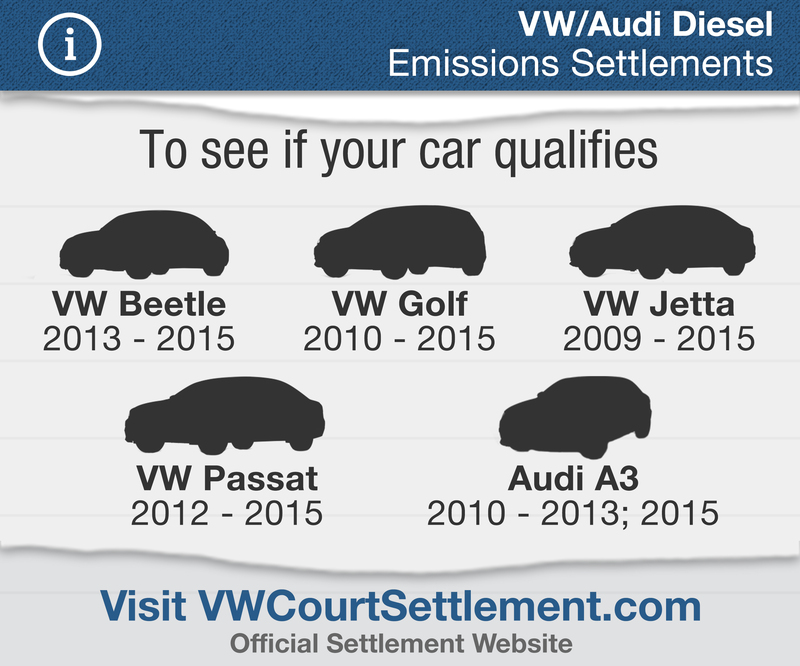 Volkswagen will begin processing claims only after the Court grants final approval of the Settlements. An independent third-party will review offers before they are sent to Eligible Consumers. Former owners who choose to participate in the Settlements must register by September 16, 2016, to claim benefits under the Settlements. If these eligible sellers do not register by September 16, 2016, they will lose their benefits. Eligible Owners or Lessees that want to retain their right to sue Volkswagen regarding the issues in the lawsuit must exclude themselves from the Class Action Settlement by September 16, 2016. (If they exclude themselves, they can still obtain an Approved Emissions Modification for their vehicle at no cost, if one becomes available. They will not be eligible for the other benefits provided for by the Class Action Settlement if they exclude themselves). Eligible Owners, Eligible Lessees, and Eligible Sellers can object to the Class Action Settlement by September 16, 2016. The Court will hold a hearing, which is anticipated to be on October 18, 2016 at 8 a.m. (Pacific Time) to consider whether to grant final approval to the Settlements. For more detailed information, visit www.VWCourtSettlement.com.